The No. 58 Awanyu Aztec Parker: $12.00! The original retail price was $12.00, that is. Currently, it is a little more expensive: $24.950. If you are looking for something to collect, this is an extremely rare pen – a holy grail for collectors. 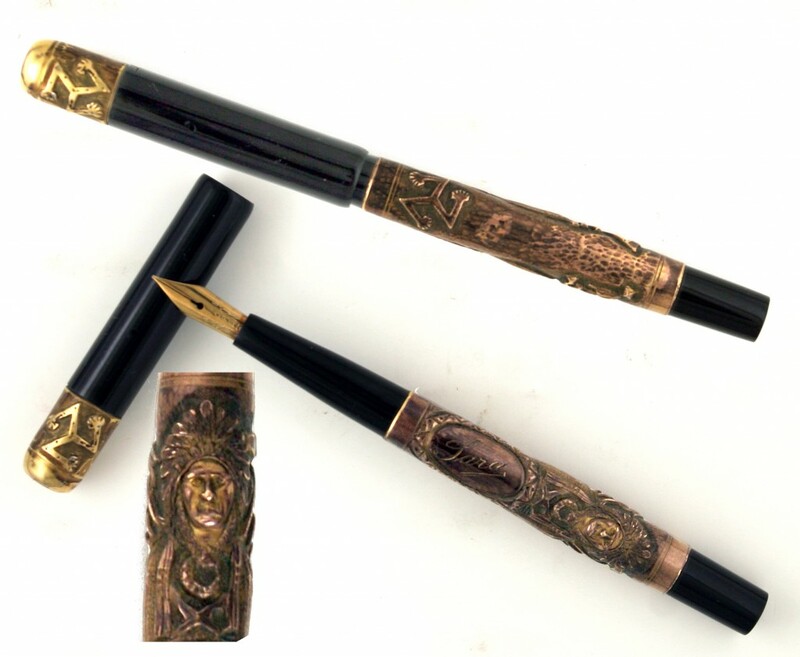 This pen was inspired when George Parker vacationed in Mexico and saw wonderful Aztec relics in a museum. He obtained permission to use the three armed triskelion design, the symbol of preserving life, mythical power, and the guardian of springs and streams. The fine details of the pen also shows the head of an American Indian Chief with head dress and wearing a snake necklace. The indicia is engraved with “Lara” in lovely script. This vintage pen is a hard rubber eyedropper-filler, and comes in near mint condition with the original box, with eyedropper. It doesn’t get much better than that. This is truly a rare pen, and it is unlikely you will find another in such condition. Calling all collectors! It has an 18K gold-filled half-overlay with a cap crown, and is fitted with a Parker Lucky Curve 3 nib. For the collectors out there, this No. 58 was one of four models of the Awanyu made. There was also a No. 57 Awanyu ”Aztec” Sterling Silver half-overlay with cap crown, as well as a No. 59 Awanyu ”Aztec” full Sterling Silver overlay, and a No. 60 Awanyu ”Aztec” full 18K gold-filled overlay. I’d like to purchase some of your products. Please let me know how I can get it. Thanks.